But only 500 of them are sending real visitors. It’s less than 1%! So, if a site as big as SEJ is struggling to get referral traffic, what can us mere mortals do? How do we build links that will bring in real traffic from referring sites? Is it a common trend or a digital marketing specific? Before I share with you how I find and acquire links with the highest traffic potential, let’s look at other industries. Do they face the same challenge or is it just an issue in the marketing space? The situation is the same in other industries, from financial technology to big media. The way people consume content – These days, people prefer to scan content rather than read it properly. Thus, the links that are incorporated within the content sometimes go unnoticed. The rankings of the referring site – If the site doesn’t rank well in search engines and has no built community, the link from it is unlikely to bring in too many visitors. For many marketers, referral traffic is not a priority – Ask any search specialist, agency-employed or in-house, why links are important, and they’ll tell you it’s because they improve SEO. Referral traffic won’t even make it to the top three reasons. My approach considers all these factors and focuses on getting links that are not only good for SEO, but also bring in traffic. I run a small boutique agency with a strong focus on link building and digital PR. We value each and every client and constantly invent new ways of increasing their lifecycle. Link building is a long-term strategy that can start paying off only in 3-4 months or even longer depending on a client’s domain authority, quality of content, other sources of traffic etc. But all businesses, regardless of their size and circumstances, want to see immediate results, so generating links that bring immediate value (e.g. referral traffic) is our best option to offer. In this case, we have to invest more time and effort into acquiring a single link, but once we’ve started scaling up this strategy, we’ve seen a huge positive effect. Our customers could see the value of these types of links and were ready to extend their monthly retainers. The main sources of referral traffic are… direct and organic traffic! Before I share with you my step-by-step on how to build links that are guaranteed to bring you referral visitors, I need to mention that these links should come from pages with a lot of incoming traffic. That’s logical: the referral traffic that comes to a page via a link is fueled by the traffic that the referring domain owns. So, by looking at its traffic sources you can see what kind of referral traffic may be sent your way. You can check the domain’s traffic distribution in many tools, but I usually use SimilarWeb. Please note that in most cases, SimilarWeb’s data is estimated. So, while it can be a useful benchmark, it’s not entirely accurate and should never be used to inform important decisions. And while SimilarWeb is a paid tool, you can get most of the data you need using the free version (just use the search bar at the top of their site). How many sites do you know that can boast these numbers? This site’s community is clearly dedicating a lot of their time to interacting with it, which indicates their interest and trust. If the overall volume of traffic is high enough, a website with a lower % of direct traffic may still have quite a substantial engaged community. And you may find that SimilarWeb doesn’t have data on smaller sites, which can be a good barometer of sorts. The ability to launch a live discussion is vital in the digital space. So if people are reacting to blog posts not only with likes, but comments, it’s a very good sign. This one can be found with the help of Buzzsumo. In the Content Research section go to Content Analyzer, select the time span and input the domain name. It will show you the number of shares across various social media that the pages of this domain are getting. If the number of shares is high — then the community is active, that is, the link from this website is capable of bringing you traffic. Instead of doing it manually, you can use SEMrush, in particular, their Social Media Tracker tool. Go to Social Media Toolkit, pick Social Media Tracker and set up the campaign. Then, input the time period and see how the domain’s social channels were performing. Active social media? Engagement is growing? Then it’s another sign of active community. Without a doubt, a website with an active community can be a great source of referral traffic, but finding the right ones to reach out to is a tricky task. Micro influencers (niche experts with an average 1000 to 10000 social followers) usually have great communities. Their users value the short distance between themselves and the blogger and actively engage in conversations. So, personal blogs of micro influencers are a good starting point. Organic search traffic can also fuel referral traffic. If a particular page is ranking well in Google and attracts a decent amount of search visits, some of this traffic will go to the links on the page. 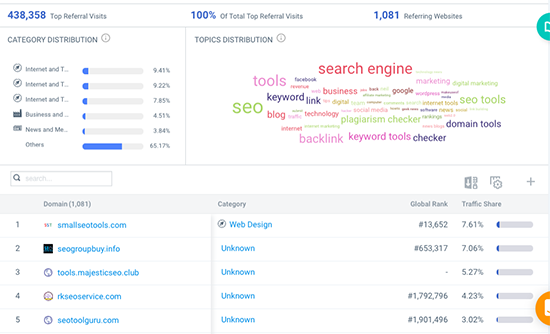 In tools like SEMrush, Ahrefs, and SpyFu, you can check how much organic traffic a particular page is getting. This means that this page can send a substantial number of referral visitors to the tools on the list. The first step is to put together a list of sites that are bringing referral traffic to your competitors. You can do this with the help of various tools. 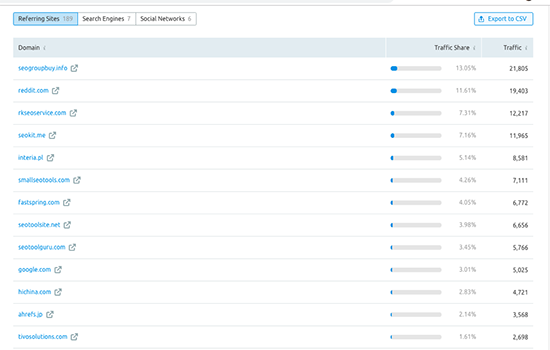 For example, in SEMrush it can be done in the SEMrush Traffic Analytics tool. Just enter your competitor’s web address, hit search and click on the “traffic sources” tab. While SEMrush is a paid tool, you can run a number of traffic searches each day with a free account. Although data will be fairly limited so you may need to search several of your competitors to build a more substantial list of target sites. I recommend exporting this list to a spreadsheet. The second step is to find the exact pages that are sending traffic to your competitors. Personally, I prefer to use Ahrefs as I can search for a domain name right inside the backlink report. And, it shows me how many links from the analyzed domain link back to the site that I’m investigating. First, you need to take the URL of one of your competitors that you found in the previous step and enter it into the Ahrefs Site Explorer tool. Then, click on “referring domains” on the left-hand side. You’ll get a list of domains along with various metrics. A lot of domains likely won’t be relevant such as websites like Facebook, YouTube, etc. But a quick way to cut these down is to enter the name of your niche/industry (or related word) into the search box. So if you’re involved in the health/medical industry, just type “Health.” and you’ll find the list becomes far more useable. Next, we need to look for the “Links to target” column (pictured above). You’ll see a button with a downwards arrow. Once you click that button, you’ll see a list of the individual pages from the domain in question. These are the pages that are linking directly to your competitor. When you see a decent amount of search traffic, look over to the left and you’ll see the URL linking to your competitor. This is the page you’ll want to get a link from. So, continue through these domains and pull out the pages that are potentially sending traffic to your competitor and make a list. In your list, you’ll only need to note down the page URL. I’ll show you how to get the traffic data & other metrics in bulk in the next step. Ahrefs is a paid tool but they offer a free trial which may be enough to build out your list. Alternatively, if you don’t want to use a paid monthly tool, you could pay for a month, grab all the data you need, and cancel before the end of the month. It’s worth noting that completely free tools with this sort of data don’t exist. So, step three is to get traffic estimations for each of those page URL’s your list. This will allow us to prioritise the list of page URL’s we found in the previous step. This done using the Ahrefs Batch Analysis tool. It allows you to process up to 200 domains (or pages in this case) at once and provides plenty of data, including search traffic estimations. After copying and pasting all of the page URL’s on your list into the Batch Analysis tool, you’ll get a table with plenty of data. Search traffic is the important metric here but others such as referring domains can be useful too. You’ll then be able to export your list and add filters in Microsoft Excel or Google Sheets – this will allow you to prioritise your list easily. What content can be updated with a link? Now that you have the list of pages that have links to your competitors and bring them referral traffic, it’s time to get a link for your own site. First of all, not all posts can technically be updated with a new link. However, there are posts that can be a good target for your outreach campaign. Updates to these pages are welcome, even out of the regular update schedule (let’s say, annually), as they only increase the value of content. Posts that include lists are a good outreach target. If the post itself is the list, this typically takes more effort, so it can sometimes be easier looking for smaller sections of bullet point lists within the piece of content. Company’s employees can post to the corporate blog under their own name. In that case, they might have editorial access, which allows them to insert changes beyond the usual editorial process. Personal blogs are the easiest to approach. The author has complete control over their content and can make whatever changes they wish to. What else should be considered before starting the outreach process? Before you start sending emails to your super-relevant curated list of site owners, I highly recommend that you consider the following basic principles of email outreach. First of all, ask yourself if you are going to contact the person who’s in charge of making the decision about placing a link. In other words, is this person relevant to your request? If not sure, double check. Still not sure? Triple check. You can’t be too confident about this since irrelevance of the information in the email is one of the main things that lead to failure of your outreach campaign. Think about connecting with the post author beforehand. People are way more eager to respond to a person who they’ve met or at least heard of. This is why I love Twitter — it allows to engage with people without being a connection. My second favorite is LinkedIn as it definitely helps to build closer relationships. Besides using social media platforms such as Twitter and LinkedIn, you can also leave comments on blogs — that’s another popular tactic. Especially for personal blogs where the person you’ll end up contacting will be the one replying to your comments. And of course, think of the value you are going to offer them in exchange. The old approach of “Hey, you should link to my post because your readers will love it.” isn’t very compelling. But an offer to promote their content, or invite them to an exclusive community is. 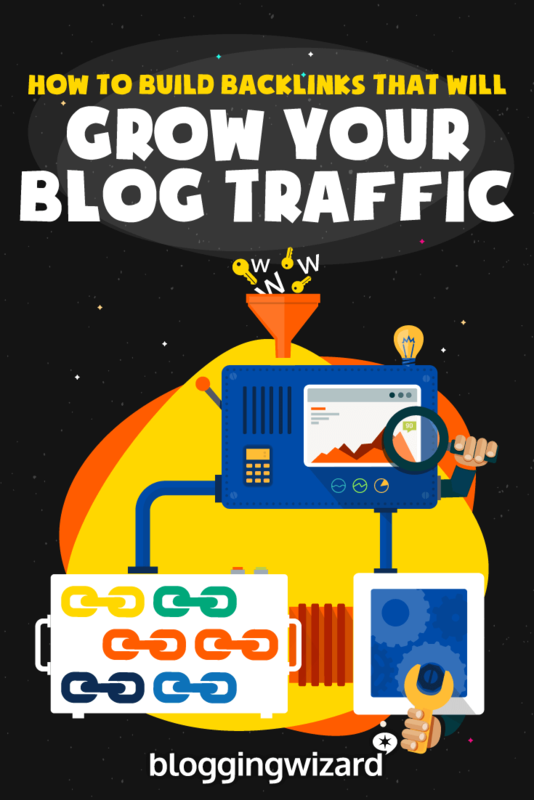 Traffic generating links are the best links. Not only will you potentially get long-term referral traffic, you’ll also get the SEO benefits too. They may not be the easiest to acquire, but they’re well worth the extra time and effort. Now you know how to find link targets that will be more likely to drive traffic, and which content types will work in your outreach campaign. So, go out there and get started! Alexandra Tachalova has worked in digital marketing for over six years. She is a digital marketing consultant, helping digital businesses to open new markets and boost sales. Alexandra is a frequent speaker, and is the founder of online digital marketing event; DigitalOlympus.net.